Whether aerospace parts or luxury goods, the new technology will make counterfeiting impossible, said the researchers. LONDON: Researchers have developed a technology that could make identifying fake products as convenient as simply scanning them with a smartphone app. "It is wonderful to be on the front line, using scientific discovery in such a positive way to wage war on a global epidemic such as counterfeiting, which ultimately costs both lives and livelihoods alike," said Professor Robert Young of Lancaster University. With this technology, scheduled to be presented at the ongoing Royal Society Summer Science Exhibition in London, a smartphone app will be able to read whether a product is real or fake. The new invention was made possible through pioneering work on the thinnest, strongest and versatile material, graphene. Materials like graphene are one-atom thick (so-called 2D materials). They can emit light that can be measured with a camera. When light is shone on the 2D material, tiny imperfections shine causing the material to emit light. This glow can be measured as a signal, unique only to that small section of material. The signal can then be turned into a number sequence which acts as a digital fingerprint. The small flakes which are invisible to the human eye and 1/1000th of a human hair can then be added to everyday items such as money, credit cards, passports and gig tickets. A smartphone app can then read a photo to tell the unique signal from the flakes and detect whether the product is genuine or fake through the right fingerprint or wrong fingerprint. 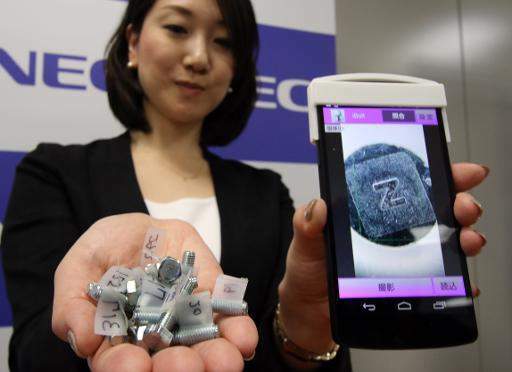 The customer will be able to scan the optical tag on a product with a smartphone, which will match the 2D tag with the manufacturer's database, the researchers said. This patented technology and the related application can be expected to be available to the public in the first half of 2018, and it has the potential to fit on any surface or any product, so all global markets may be addressed, according to the researchers.